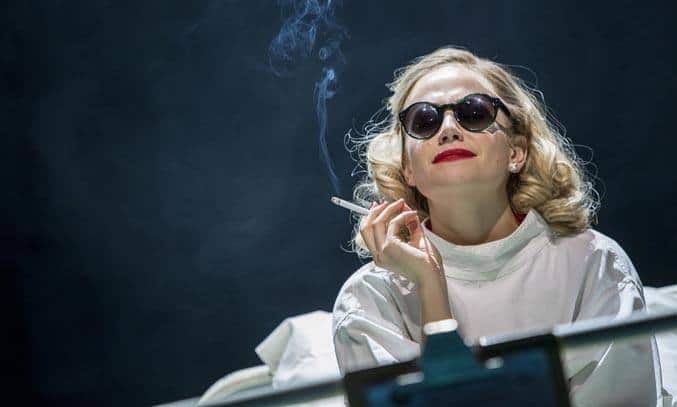 More than 50 years after the release of the iconic film, BREAKFAST AT TIFFANY’S is given a new lease of life in a brand-new stage production starring the pop princess Pixie Lott. Based on the classic novella by Truman Capote, BREAKFAST AT TIFFANY’S tells the story of Holly Golightly (Lott), a young New York socialite who becomes friendly with a young, aspiring writer “Fred” (Matt Barber) who has moved into her apartment building. Golightly is society girl looking for the right rich man to marry and Fred is fascinated by her curious lifestyle. The novella was loosely adapted into film in 1961 starring Audrey Hepburn and George Peppard and won two Academy Awards for Best Original Score and Best Original Song. Slick, stylish and sophisticated, there is plenty to love about this sparkling new production of BREAKFAST AT TIFFANY’S. Visually, the production shines like a Tiffany diamond with Matthew Wright’s fast moving sets and stunning costume design evoking a decidedly filmic-feel and Ben Cracknell’s impressive lighting effects boasting enough colour, style and visual panache to capture the hearts of audience. Tony and Olivier award-winning playwright Richard Greenberg does a decent job of adapting Capote’s novella for stage, its tone staying truer to the book than the film with its wordy monologues and tart language. The story is very much focuses on Fred and Holly and as such, the piece feels a little intense at times with little room for light-heartedness and some of the humour falling flat. 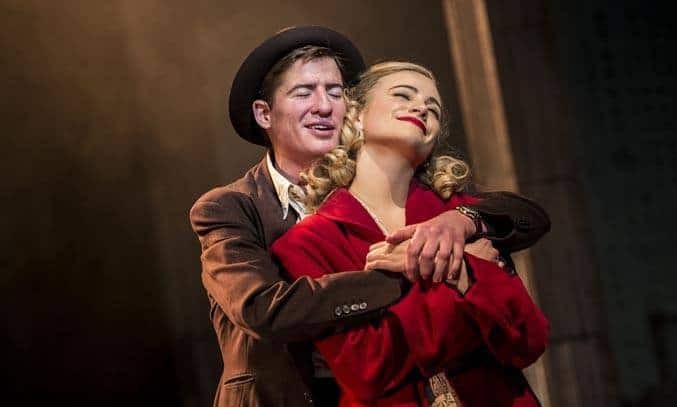 That said, there are some strong cast performances, particularly from Pixie Lott as Holly Golightly and Matt Barber as Fred. Lott overall impresses in the iconic role, looking every bit as stylish as Audrey Hepburn in her black dress, sunglasses and red lipstick. Her performance boasts enough drama, charm and charisma to demand your attention, even if her American accent does sound a little incomprehensible at times. Barber delivers a strong performance as the Fred, the penniless writer retelling his story some 15 years later. Barber’s multi-layered performance takes us on a journey from infatuation and love to friendship and acceptance. Lott and Barber are supported by a small but talented cast of 10 actors who deliver a strong performance but have little chance to make much of an impact, drifting into background with the possible exception of Robert Calvert as Holly’s husband Doc. I was also disappointed to find that there were only three musical numbers in the production – People Will Say We’re in Love, Moon River and Hold Up My Dying Day. To be fair, the new production is described as a “play with songs” rather than musical but with Lott in the lead, I was expecting the director to make more of her talents as a musician. Those expecting the romantic ending of the 1961 film will be in for a shock with the production staying true to Capote’s original finale in which the two protagonists go their separate ways and the audience is left wondering – just like Fred – what happened to Holly. You can’t fault it for its style and panache however, with acclaimed theatre director Nikolai Foster delivering a slick and stylish production full of colour, charm, style and charisma.